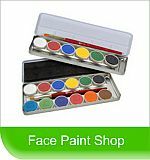 Welcome to Absolutely Painted Faces, a face painting service for Bristol, Bath and North East Somerset. Run by a professional, friendly and creative face painter qualified to a degree level in design and with many years creative drawing experience. Any event can be catered for from grown up evenings such as pre going out drinks, hen parties, birthdays to all kinds of children's events including birthday parties, festivals and village fetes. Corporate and fund raiser events can also be catered for with full public liability insurance which covers every situation from private residence to pubic events.